This rack is for my IvyCycles frame. It is designed to work with a handlebar bag that has Ortlieb hooks under the front of the bag. The rack is made out of 5/16" x 0.028 tubing, and all of the material came from one 4' section of tubing. 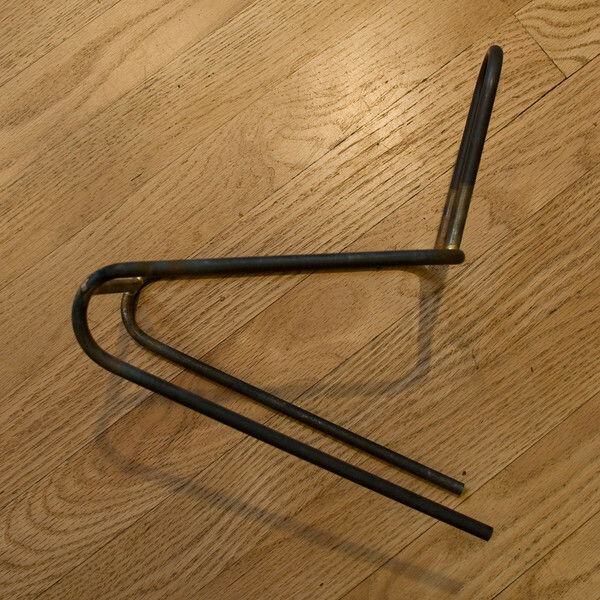 The design has few brazed joints, but slightly more complicated bends than a normal rack. Rory Cameron gets credit for the basic design. He designed a rack similar to this one for his Jeff Lyon custom frame, but the implementation was never realized. I bought it from Dillsburgh in PA. If you poke around in the bicycle section of this website you'll find a year old price sheet. This sure looks nice! Where are you purchasing your 5/16 x .028" tube? I've bought from AircraftSpruce in the past, but they now list the price for .028" as 6.25/ft! The .035" tube is only $3.20. Is there a cheaper source for the .028?